Like I said in the Montenegro post that we had to take a bus from Ulcinj and then to Shkoder instead of just taking a direct bus that would have saved us time and money. There were only 3 bus times- one being at 6 AM which is the one we took. We were dropped off in a random part of town since there’s no bus station. Before getting to Shkoder I had imagined it would be like any lake town I’ve been to where there are trees everywhere making a thick forest, tranquility, fresh air and a small, friendly town. I was very wrong. 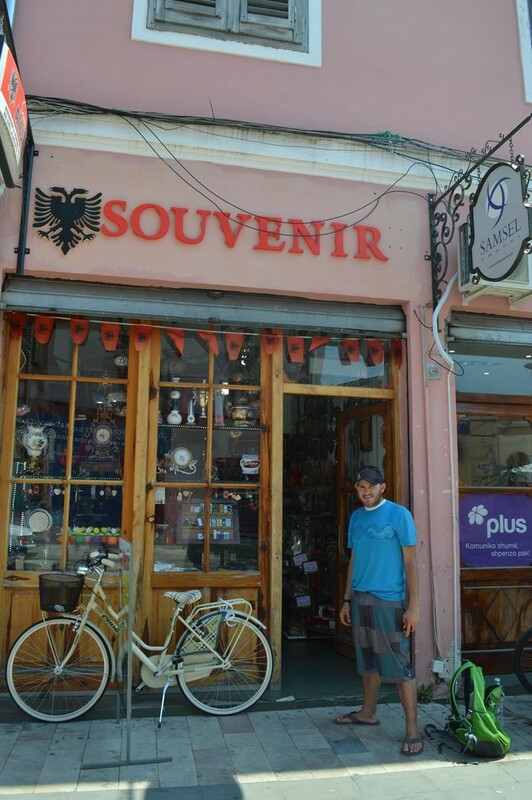 Our first hour we were in Shkoder involved hiking with our backpacks through crowded and dirty streets. It was a little after 7 AM and people either had shops open or were preparing to open by cleaning the sidewalk or moving around merchandise. Of course we were the weird ones and everyone was staring at us like we had six eyeballs sprouting out of our heads. I started to realize that not many people probably backpack here, and I understood why. The streets seemed so chaotic with cars and people zipping every which and where. Garbage littered the streets and we followed behind a herd of cows being whipped forward by a guy on his bike. The closer we walked to our guest house the more horse and buggies we started seeing. There isn’t official public transportation in Shkoder, and instead there are random people who are unofficial taxis and drive to different locations dropping people off. You’d simply jump in someone’s van, negotiate a price and off you go. One of the problems with this is that most of the locals didn’t speak English so who knows if you end up in the right place. Thankfully our host had a friend who rents bikes so he borrowed some for us and that was how we were able to get around town. 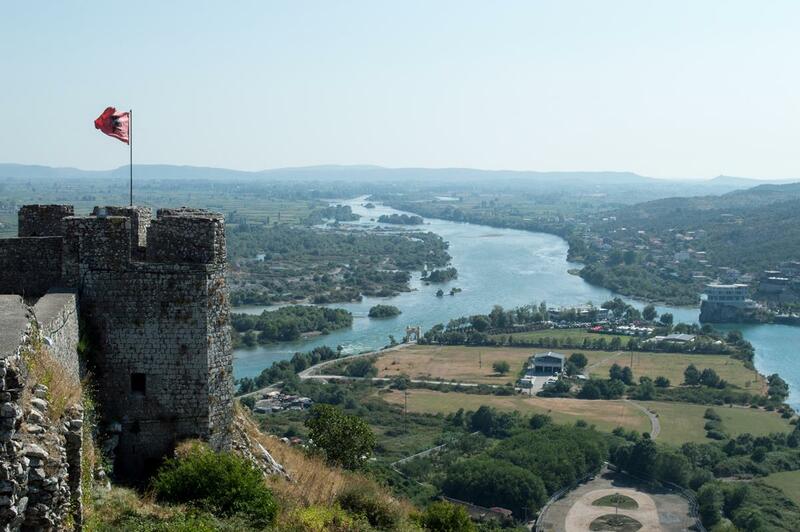 Obviously in other areas of Albania there are more places to go and see, but these are the only places worth seeing in Shkoder and nearby. Places that say Cafe or Restaurant don’t actually serve food, but instead only serve drinks. We went into several of the local Cafes and Restaurants and when we asked what food they had they looked at us like we had asked them where babies came from. Even stranger was that they didn’t know exactly where we could get food and kept directing us to similar “restaurants”. I was starting to wonder if anybody ate around here or if they all get their necessary fill from their little lattes and cigarettes. The water is definitely not drinkable in Shkoder so buy bottled water. Even in Tirana, the capital, we heard the water is bad because it sits in tanks so be on the safe side and drink bottled water. The day we had arrived in Shkoder was Sunday and in the morning when we were walking to our place the streets and sidewalks were chaotic. However, when we walked out of church that afternoon there was complete silence and hardly any cars or people on the streets. I would’ve felt like whispering to Pablo would wake up the whole town. Absolutely weird, and I felt like we hadn’t gotten the memo about some outlaw coming into town lookin’ for a killin’. Our friendly host had told us that he would drive us to the bus we would take out of Shkoder to Tirana so we woke up at 5 AM and waited for him. After a couple hours he showed up apologizing that he’d forgotten to set his alarm. This was exactly the start I should have expected for the horrible day we were about to experience. Pablo and I arrived in Tirana only a couple hours after leaving Shkoder and set out for the supposed bus station that has buses departing every hour throughout the day. We asked a travel agent where the bus station was and she gave us directions, which led us to another travel agency. We asked a taxi driver where the bus station was and he too led us to a travel agency. Apparently the only international bus station in Shkoder and Tirana are travel agencies! There were only a couple times for travel agency buses into Skopje so we had to go with a later bus (4 PM) meaning that we would arrive in Skopje at 10 PM (according to the travel agencies and the bus drivers the drive would take 5-6 hours). WE ARRIVED IN SKOPJE JUST BEFORE 1 AM! I was ready to tear my eyes out, it was incredibly frustrating and the crowded, hot bus was unpleasant to say the least. The bus drivers made several stops to smoke, and after we‘d finally arrived in Skopje we learned from the Skopje taxi drivers that it was normal for the bus ride to take 9 hours. Why on Earth do they still tell people 5-6 hours, and better yet, why on Earth should it take that long?! Overall with the transportation, it’s easier to fly to Italy from Albania than it is to travel by bus to a city only a few hours away. This unnecessarily complicated process made us wishing again that we had just bought a car to drive through the Balkans. Shkoder was such a bizarre town, and overall we really didn’t enjoy it. I hope that anyone else who has been there has had a better experience than us, and I would love to hear about it. I’m sure we went about it the wrong way completely and think that the best way to travel through Shkoder and Tirana is driving your own car and stopping in for only a couple days. We heard that it’s better to stick to the coast in Albania, provided that it’s more South. Places like Vlore and Sarande were recommended afterwards by some friends, as well as to Butrint where there are cool looking ruins. Make sure you try those places out for us! Did you have a better experience in Albania? 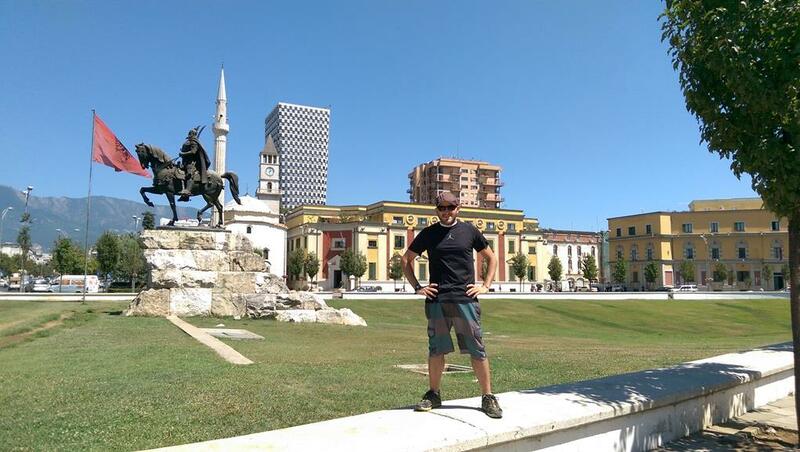 I travelled through Albania in a camper the way to travel me thinks…. Very Funny made me smile for the day …Albania crazy place but the people are very friendly and normally very pleased to see you… I agree with the finding places to eat it made me wonder how do these people get so fat but then i guess its the beers, burgers and kebabs because these seem to be the main menu in most places…I think they have a lot to learn about tourism, one thing they need to learn is pick up the rubbish or don’t drop it in the first place..